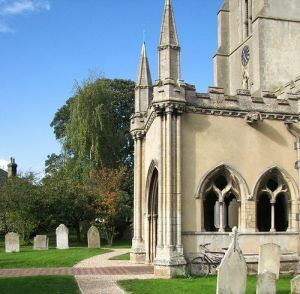 A 13th and 14th-century church of Barnack limestone, much restored in 1840. The highlight of the 14th-century work is an abundance of Decorated Gothic ornamentation, including traditional flower-balls and a wonderful collection of gargoyles in the shape of birds, beasts and strange monsters. The other feature of note is the lovely south porch, rather oddly lacking some of the ornamentation visible in other parts of the church, but a wonderful piece of architecture nonetheless. The porch was built over the years 1320-1330 and the entrance is flanked by a pair of octagonal spires. The interior of the porch is vast, as large as many a cathedral porch. St Mary's is one of the numerous medieval churches in the area that were under the patronage of Ramsey Abbey and is probably the grandest of the abbey's daughter churches. The building consists of an aisled nave with clerestory, south porch, chancel, and west tower with spire. The early 14th-century spire is extremely striking; it rises to 156 feet and is one of the highest in Cambridgeshire. At the base of the tower is a very grand west door in Perpendicular style, topped by a quite lovely carving of the Virgin Mary. It is rather unusual to find a carving in such an accessible location that has survived the destructive impulses of the Reformation iconoclasts. The interior is a symphony of 14th-century architecture. There are a number of historically interesting features, including a Jacobean pulpit with a canopy, and a beautifully carved medieval rood screen. The most interesting bits, however, are the collection of medieval misericords in the chancel. Among these are carvings of heraldic shields, and images of strange beasts, demons, and lions. The misericords may have been brought to Over from Ramsey Abbey when the abbey was dissolved by Henry VIII in 1539.